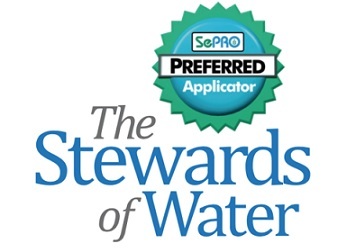 Application of EPA-registered and state-permitted aquatic pesticides is the most cost-effective solution to managing pond weed and algae growth. Any pond management effort must include integrated pest management (IPM) techniques and watershed’s best management practices; however, our 20+ years of experience proved that regular, low-dose application of algicides and herbicides by licensed, certified aquatic professionals is overwhelmingly successful, particularly where budget is limited. Click below to read more about the aquatic pesticides that we use. Duckweed (Lemna spp. ) and watermeal ( Wolffia spp. ) "hitchhike" from pond to pond, carried by ducks, geese and other water birds. Sonar AS can provide season-long control of duckweed and watermeal. Pithophora sp. is one of the most difficult summer algae to control. Captain XTR was the correct prescription for this pond. A single Spatterdock (Lily Pad) plant can overwhelm acres of water. Sonar Q provides excellent Spatterdock management. By definition, a weed is "a plant growing out of place". Plants can benefit a pond’s ecosystem, but they become “weeds” when growing out of control or in areas where they interfere with the pond usage. Excessive plant growth can create a variety of problems including stunted fish population, mosquito growth, foul odors, unsafe swimming conditions and clogged irrigation pipes. These issues can cost thousands of dollars in repairs and lost ornamentals. Lakes and ponds are threatened by excessive nutrients entering through lawn and garden run-off, wastewater discharges, detergent wastes, septic tank seepage and agricultural run-off. Excessive nutrients support dynamic growth of aquatic algae, interfering with intended water uses and sometimes presenting health hazards to humans and animals. Blue-green algae can cause illness and sometimes fatalities in pets, livestock and wildlife. Exposure to or ingestion of blue-green algae can also lead to a variety of discomforts in humans. Algae contamination can discolor drinking water and create unpleasant odors and tastes. Excessive algae growth can also impart distasteful flavor to fish. Algae decomposition can deplete oxygen in bodies of water and kill fish. Excess algae can impede water intake from fire ponds and irrigation systems. Algae can elevate organic solid content and the biological oxygen demand in wastewater oxidation ponds. Excessive algae growth can quickly change lakes, ponds, lagoons and shorelines from scenic to unsightly.